We've been caught up in the headiness of DDR3 recently, with its mega speeds and 64-bit wonders. 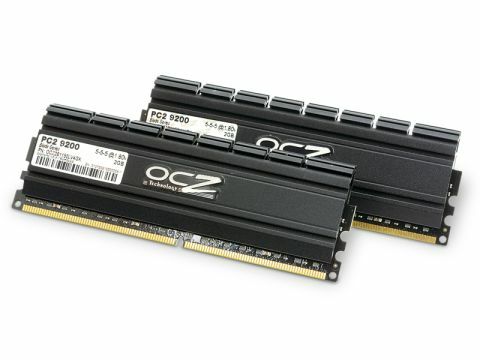 But what has become of kits like the OCZ Blade DDR2, its slightly lower speed predecessor? It's rather cheap now, and an overlooked component of ageing systems. Adding slightly more RAM to your dust magnet PC can give it a new lease of life, like a phoenix coming from the flames, only with less fire. Hopefully. OCZ's Blade is a perfectly serviceable kit, and an overclocker's dream. We happily cranked it up as far as it would go, and got a 20 per cent increase in memory bandwidth, and a 20 per cent decrease in latency. Those are good things. Very good things. The memory has a low voltage of 1.80v, which keeps it from getting too hot even if it's overclocked. It's big, chunky RAM, and the heatsinks do a very good job of keeping it cool. Older PCs tend to have problems with heat as they attract more dust than a Dyson in a crematorium, so it's good to invest in components that don't chuck out too much warmth. How much will you have to invest? This is our only sticking point: at £52, it's not cheap, expecially when compared to its lower-performance brethren. But if you're into overclocking, and want to extend your PC's performance by a few more frames, it's an excellent choice.